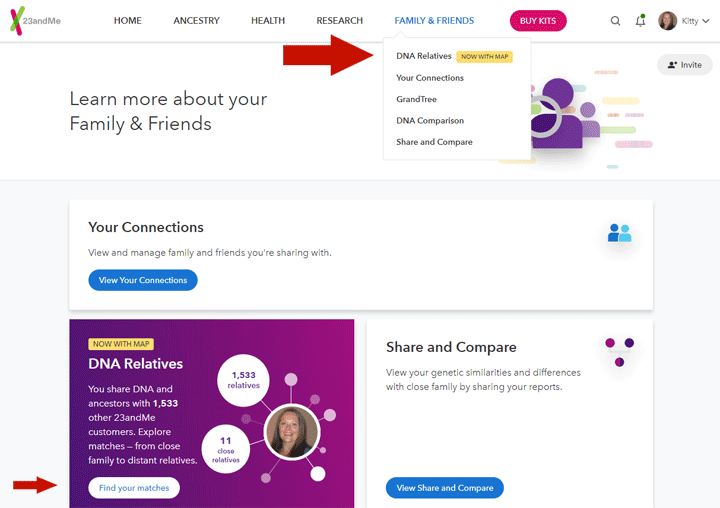 There are a number of posts on this blog which can help you navigate 23andme (click here) but as always in life, things change. Now there are many new features and ways of finding information that are not covered by those articles. Plus the tests sold during the holiday sales are coming in and I have lots of new cousins. Most importantly, you can get to the version of the chromosome browser that shows the actual segment locations and sizes from that match page. Here is why that is important. When a new tester matched me, my dad, and several distant cousins for 33cM on a specific location on the X, I knew she was related via the Fatland farm family from Halsnøy island, Hordaland, Norway, because I had previously identified the ancestral source of that segment from the 1700s (click here to read about that). It took me a little over an an hour using Ancestry’s possible parent clues to build her a tree and find her descent from that family. It helped that I knew what I was looking for and only one of her Norwegian lines was from the Hordaland region. 23andme does not do tree matching for you like Ancestry does, but it does provide a chromosome browser. 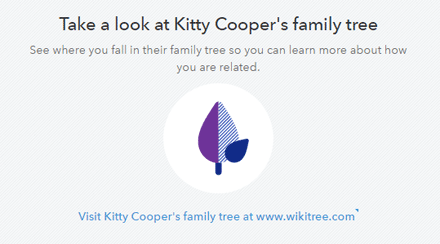 This means that sometimes you can tell from the segment that a cousin matches you on who the likely common ancestor is. When you keep a large master spreadsheet of all your matches from all the companies, this can sometimes be quick and easy (click here to read about using spreadsheets for DNA ). 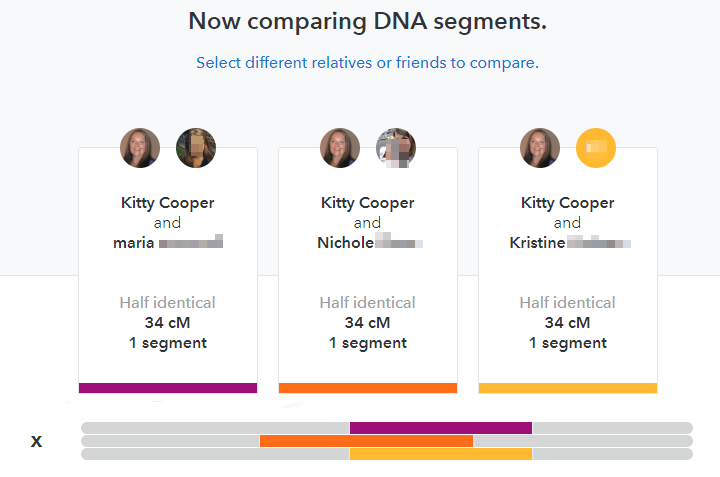 There have been some good changes to the relative matching displays at 23andMe. Finally when I get a new match, I can quickly compare them to several other known relatives from that first DNA comparison page. One of the features I have always loved, that 23andMe has but not the other testing companies, is the ability to compare my matches to each other. Seeing how much DNA they share can often help resolve how they are related. I was surprised and delighted to see that the granddaughter of my Dad’s favorite brother got a DNA kit for Christmas and her DNA results are just in at 23andMe. 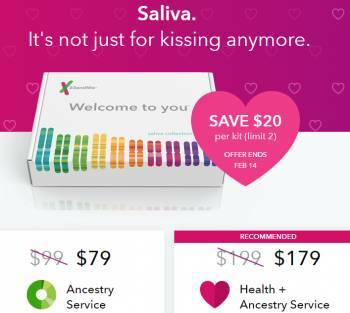 So I will use her kit to show the new 23andMe displays. For privacy I will call her Nan. When I click DNA relatives under Tools, the page it goes to no longer has two top tabs. Perhaps that confused many users. Instead there is a long sentence up top where the last few words are linked to the chromosome browser page that I like to use. I have put a red box around those words in the image below of Dad’s best matches. Of course there are other better ways to get to that browser. When Dad gets a new relative, I typically click on their name to see how they compare to him. That next page is the one that is vastly improved. 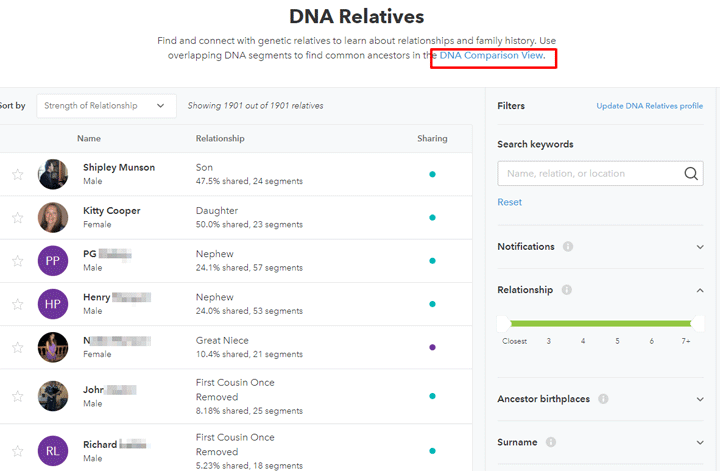 Did you know 23andme now provides the segment data for its ancestry composition assignments? This is a pretty recent feature and might even be useful. Unlike the other companies, 23andme does its admixture (aka ancestry composition) in chunks. This may make it more accurate than the others but in any case it means that they can give us the segment numbers. Then we can compare those to our matches. To get these numbers, first pull down the reports menu and click on ancestry. 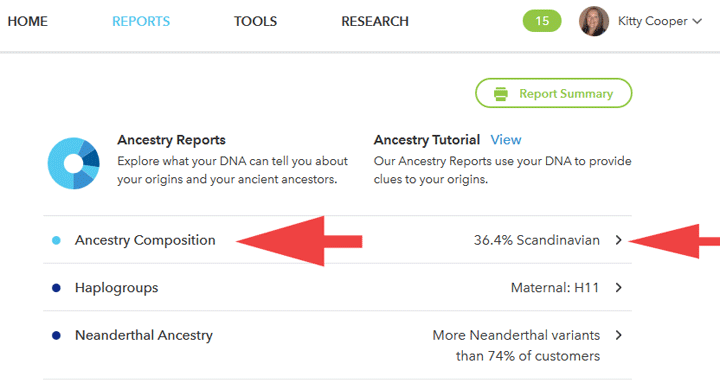 On the initial ancestry page click on Ancestry Composition or the > symbol next to your highest group. Both are marked with my red arrow below. The next page, the ancestry composition page has the pretty chromosome picture with ancestries displayed where you can change the confidence level from speculative (50%) to conservative (90%). To get a CSV file of the segments you click on Scientific Details at the top or the bottom of this page. Then scroll all the way to bottom of that next page until you see this. You can select your confidence level as well for your downloaded data.